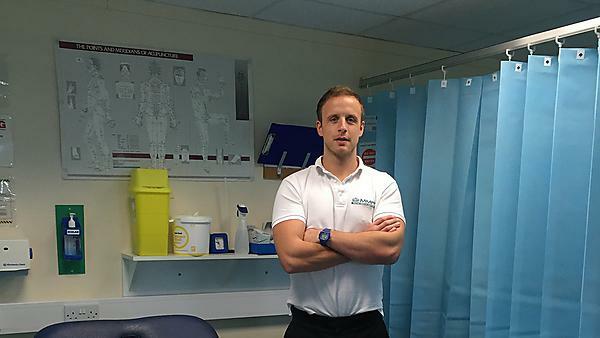 Since graduating in 2009, Tom Rogers has gone on to work as a physiotherapist at Swansea City Football Club and for the military. Tell about your career path since graduation. I began working for Exeter City FC within the academy structure as their first full time physiotherapist after qualifying in August 2009 from Plymouth University. I spent one year in this role before applying for a job at Swansea City FC. I was successful and I have been a physiotherapist at Swansea since 2010. Since September of this year I have moved on and am now working for the military as a locum physio. After gaining my qualifications I initially applied for numerous NHS posts. My aim was to commence my junior rotations whilst on the lookout out for an avenue into the sporting sector. Through the University the job at Exeter City FC was advertised: I applied, had an interview, and was successful. Professional athletes are put under high levels of physical and mental stress which directly affects you as part of a medical team. Rehabilitating long term or re-injured athletes can be very challenging in terms of dealing with the individual and their injury. It is important to remain innovative to gain compliance from the athlete who may be with you every day for a number of months. On a lighter note, my initiation song was pretty tough. Sitting on the bench next to Michael Laudrup at Old Trafford was pretty surreal. Having to run onto the pitch and act as the first point of contact in an intimidating, high pressured environment, and having to make a quick assessment and decision on a player’s fitness status was both exciting and nerve-racking. Physiotherapy in football is a small world so get your name out there in whichever way you can and impress somebody, either through voluntary or even part time work which football academies are always recruiting for. This is a great way to get experience and get your name in the mixer. Be prepared to work at all levels: be that academy or within the professional ranks of a very demanding, anti-social job that involves travelling, and weekend and evening work. However, on the bright side, be prepared for the best work environment you will ever work in. If you’re lucky enough, you will get to have great working relationships with athletes and a range of medical professionals in a team environment. Studying at Plymouth was a decision that I made very easily as I lived there at the time, I had a house, and a job. Apart from those obvious reasons, Plymouth University had been developing at a noticeable rate over recent years. New buildings were being built and the city centre campus was looking modern and fresh and areas of the city were becoming more vibrant due to the influences of the University and the students. The new Plymouth Applied Health Centre (PAHC) building where the course was to be delivered was also an attraction as it was pretty much brand new when I started. I think my year was only the third cohort of physiotherapy students. For more information about studying physiotherapy, please visit our BSc (Hons) Physiotherapy course page. For more information about our range of courses within the School of Health Professions, please visit the school page.